We want to make your car buying experience as easy as possible! We know that you are busy and your time is very precious. With everything going on in your life from basketball games, to Girl Scout meetings to travel for work, convenience and time management are surely important to you and we know that. We know sometimes it can be very hard to find time to go into a car dealership, especially when you already know what vehicle you want. 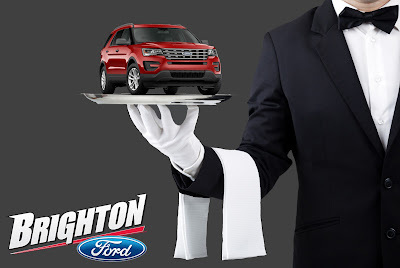 That's why Brighton Ford has simplified this process for anyone purchasing a new Ford, Ford Certified Pre-Owned or Pre-Owned car, truck or SUV. We will deliver your vehicle wherever you want...whether it be your house, your office or anywhere in between. You can buy your car and get it delivered right to you in your pajamas at home or even your lunch break at work. This is just one way for us to say thank you to the 185,000+ who have already let us earn their trust.